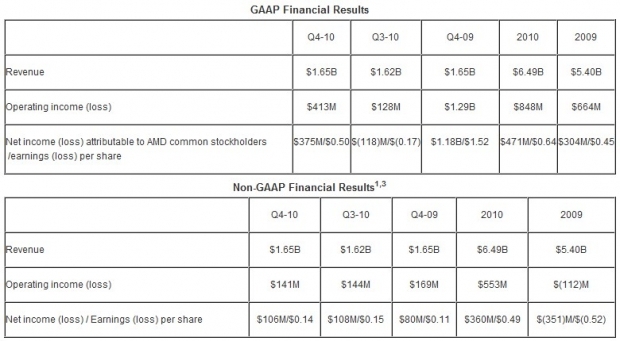 AMD today announced revenue for the fourth quarter of 2010 of $1.65 billion, net income of $375 million, or $0.50 per share, and operating income of $413 million. The company reported non-GAAP net income of $106 million, or $0.14 per share, and non-GAAP operating income of $141 million. The non-GAAP net income and non-GAAP operating income primarily excluded a net of tax gain of $236 million, and a pre-tax gain of $283 million, respectively, that the company recognized related to a patent license and legal settlement.